BeachEasyNJ has partnered with Sand Helper to bring power to the Jersey Shore! This chair is the solution if pushing a manual chair is not possible. It will go on pavement, boardwalk and most importantly any sand situation you run into! It will go up dunes and over uneven sand! It turns 360 degrees. Has 2 Batteries on board, each battery has a 4 mile charge! Batteries are 12lbs and easily brought into house to charge. Charging cord delivered with chair. This chair requires a specific sign off contract. 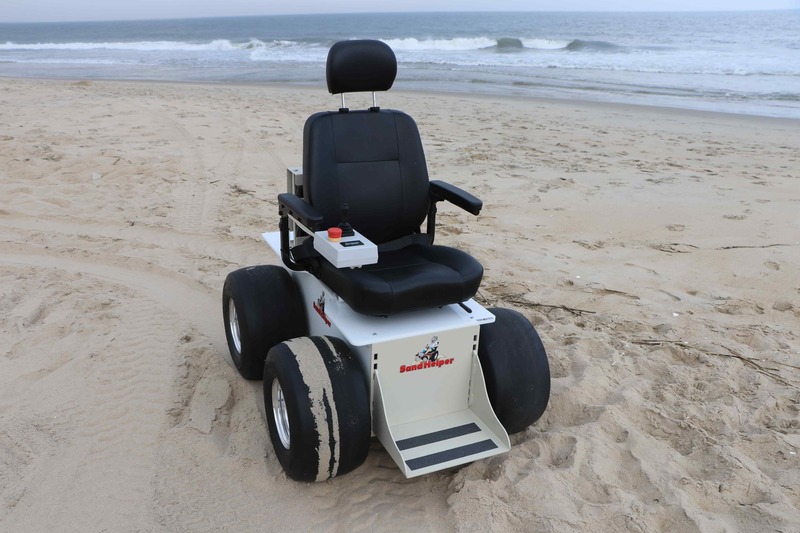 Sand Helper Electric Beach Wheelchair rents for $400+tax weekly. We deliver on Saturday and pick up the following Saturday.